Demonetisation: The 370 DCCBs in the country exchanged old notes of Rs 500 and Rs 1,000 worth Rs 22,270 crore from November 10 to December 31, 2016, of which 18.82 per cent (Rs 4,191.39 crore) was processed by the top ten. Demonetisation: Records show that four of these 10 are based in Gujarat, four in Maharashtra and one in Himachal Pradesh and one in Karnataka. From BJP to Congress and NCP to Shiv Sena, leaders of India’s main political parties are at the helm of the top 10 District Central Co-operative Banks (DCCBs) ranked according to the value of banned notes exchanged during demonetisation, records accessed by The Indian Express under the Right To Information (RTI) Act show. According to RTI records from the National Bank for Agriculture and Rural Development (NABARD), the 370 DCCBs in the country exchanged old notes of Rs 500 and Rs 1,000 worth Rs 22,270 crore from November 10 to December 31, 2016, of which 18.82 per cent (Rs 4,191.39 crore) was processed by the top ten. Records show that four of these 10 are based in Gujarat, four in Maharashtra and one in Himachal Pradesh and one in Karnataka. 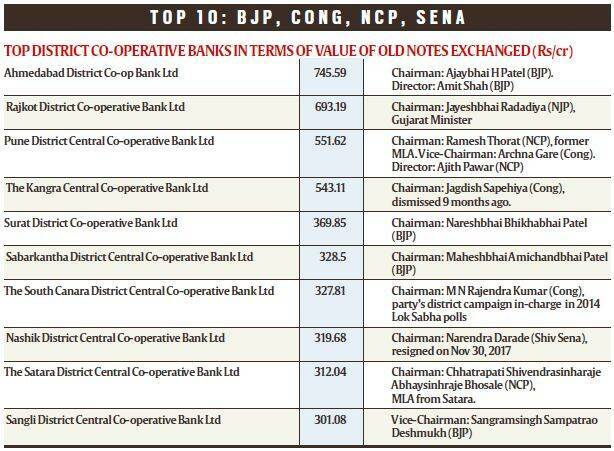 Topping the list, with old notes worth Rs 745.59 crore exchanged, is the Ahmedabad District Co-operative Bank, where BJP president Amit Shah is a director and BJP leader Ajaybhai H Patel the chairman. Second on the list, with Rs 693.19 crore, is Rajkot District Co-operative Bank headed by Gujarat Minister Jayeshbhai Radadiya. At third spot is Pune District Central Co-operative Bank, with Rs 551.62 crore, headed by former NCP MLA Ramesh Thorat. Congress leader Archana Gare is vice-chairperson of the bank, which has NCP chief Sharad Pawar’s nephew Ajit Pawar as one of the directors. Congress leader M N Rajendra Kumar, who was district in-charge of the party’s 2014 Lok Sabha poll campaign, is chairman of Karnataka’s South Canara District Central Co-operative Bank, which is seventh on the list with Rs 327.81 crore. The Nashik DCCB, which is eighth with Rs 319.68 crore, was headed at the time by Shiv Sena leader Narendra Darade who resigned in November last year after accusing the RBI of failing to deal with the impact of demonetisation. According to RTI records, NABARD has verified the credentials of 31,15,964 customers who returned old notes in the 370 DCCBs. Records also show that many of the DCCBs that topped their respective states are controlled by politicians, mostly from parties in power. For instance, records show, Tamil Nadu’s list is topped by Salem DCCB, which exchanged Rs 162.37 crore worth of old notes and is chaired by AIADMK leader R Elangovan. West Bengal’s No.1 is Nadia DCCB, which exchanged Rs 145.22 crore and is headed by TMC leader Shibnath Chowdhury. Khargone DCCB, which topped in MP, is chaired by BJP leader Ranjit Singh Dandir and exchanged old notes worth Rs 113.23 crore. UP’s topper, Meerut DCCB (Rs 94.72 crore), was chaired by SP leader Jaiveer Singh at the time. Similarly, Andhra topper Guntur DCCB (Rs 83.23 crore) is controlled by TDP leader and former MLA M Venkat Subbaiah, while Telangana’s Hyderabad DCCB (Rs 79.16 crore) is chaired by TRS leader S Penta Reddy. Also on the state toppers’s list are Chhattisgarh’s Raipur DCCB (Rs 60.65 crore), which is chaired by BJP leader Yogesh Chandrakar, and Odisha’s Balasore-Bhadrak DCCB (Rs 59.43 crore), which is chaired by BJD leader Raghunath Lenka, with another party leader Anita Bhuyan as vice-chairperson. Topping the state-wise list overall is Kasargod District Co-operative Bank in Kerala, which exchanged Rs 293.58 crore worth of old currency during demonetisation. The bank is controlled by the Left-ruled state government. In terms of overall value of old notes exchanged, Kasargod is followed by the Sangrur District Co-operative Bank (Rs 216.27 crore) in Punjab.